I came across cherimoyas on my last shopping trip. CHERIMOYAS. !!! . My favorite fruit on the planet. If you’ve ever tasted one, you’d be giddy with me right now. And if you’ve never tasted one, well you have to keep reading and get the cherimoya low-down because it’s definitely something to add to your MUST-TRY in a lifetime list… (and hopefully many times over. 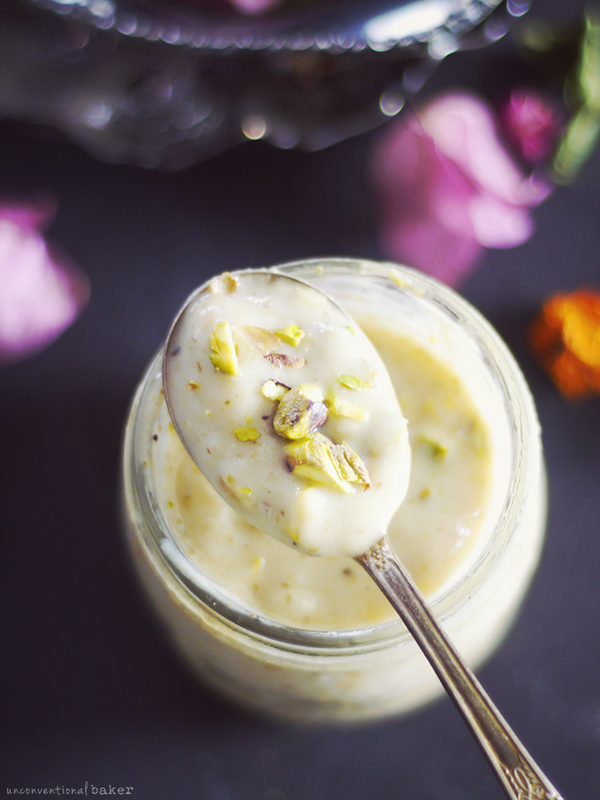 And then hopefully make this fruit-sweetened cherimoya pistachio custard pudding with them!). … And if you live in a country where these are readily available, I’m moving in I envy you. The chances of finding cherimoyas in a small town in a cold climate are like twelfth of never… And when you do find some, the experience is akin to meeting a unicorn… I do occasionally come across them when I visit a larger town… A real diamond in the rough in my corner of the world, but luckily they do make an occasional appearance and I always bring a bunch home. If they cost an arm and a leg, I’d give three of each… Because there’s absolutely nothing tastier than a ripe cherimoya. Nothing. …But as I’ve been enjoying it again these last few days, I suddenly changed my mind because you know what? 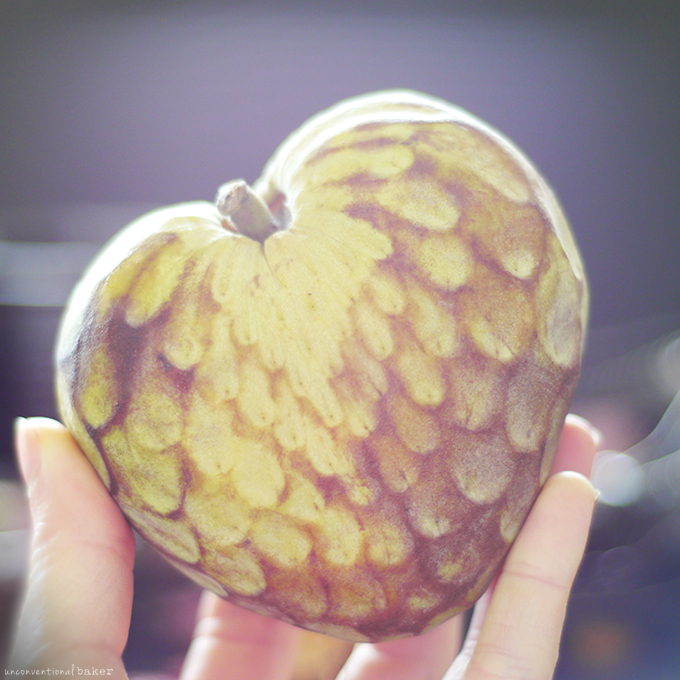 Even if you can’t find cherimoyas right now, I want you to at least know about them so you never ever pass them by unnoticed wondering what that odd fruit is…, and if you ever have a chance to grab one — it’s an absolute must. What do they taste like? Hm… like unicorn food? ;) They’re very sweet yet somehow mellow, creamy, very fruity, candy-like even… and remind me most of that flavor in Jelly Belly beans you’ve never quite been able to put your finger on… A fusion of tropical flavors. Mark Twain said it’s “the most delicious fruit known to man” and I 110% agree. …this little fella is heart shaped — how cute is that?! There are many other tropical fruits with a similar look (to an undiscerning foreigner at least..) and even similar names (the Europeans who “discovered” the Americas were really not all that creative with their names, were they…? o.O). This fruit goes by: cherimoya, chirimoya, or custard apple… or chirimuya in Quechua, the native language in the Andes, where they grow more abundantly. How to know if it’s ripe: The skin should brown up a little (as depicted here for example) and be a little soft to the touch (note: they brown up more when refrigerated). If they feel firm, they need more time. Too soft is better than too firm with these guys, though somewhere in between is just right (kind of like an avocado). Also keep an eye out on the “eye” of the fruit around the little stem to make sure there’s no mold — that’s where you’ll spot it. 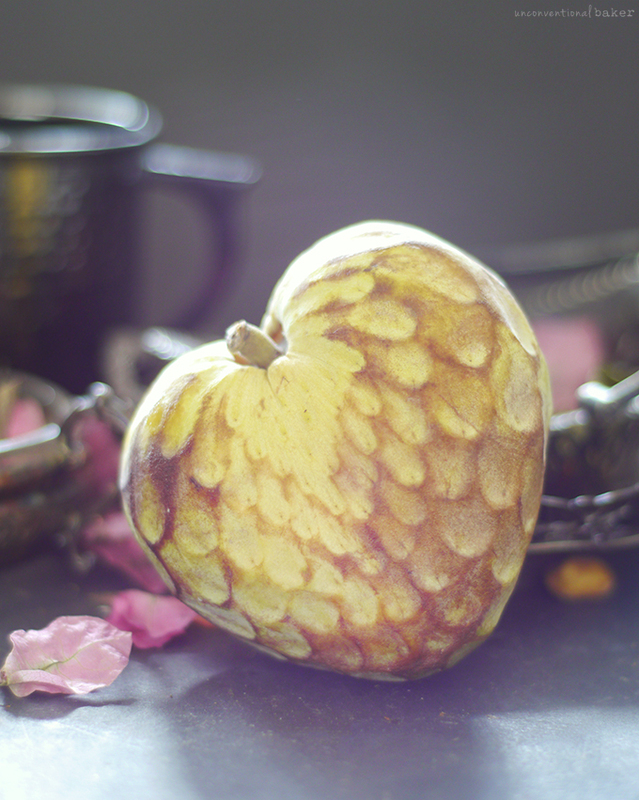 Toxicity must-know: while cherimoyas are absolutely safe to eat, their skin and seeds are toxic, so be sure to only eat the flesh and discard the rest. I learned this the hard way… I’m really an experimental eater and tend to not read up on things but just experience them more intuitively… usually it’s the best way for me to experience a new taste without any ideas tainting the experience, but this time it backfired. I knew straight away you don’t eat the seeds — those things are massive. Common sense told me to discard. But the peel I tasted and it was alright, so I proceeded to blend it into my food. BAD IDEA! Massive migraine later I knew something was up, so I went researching online. Yep, do not eat the skin! 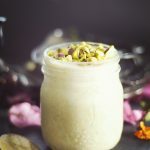 Honestly, I never thought I’d taste anything better than a good cherimoya, but after blending it in with a tiny bit of good almond milk, a dash of salt, and pistachios, I proved myself wrong. This custard is only the best little dessert in the world. The only difficult part is de-seeding. 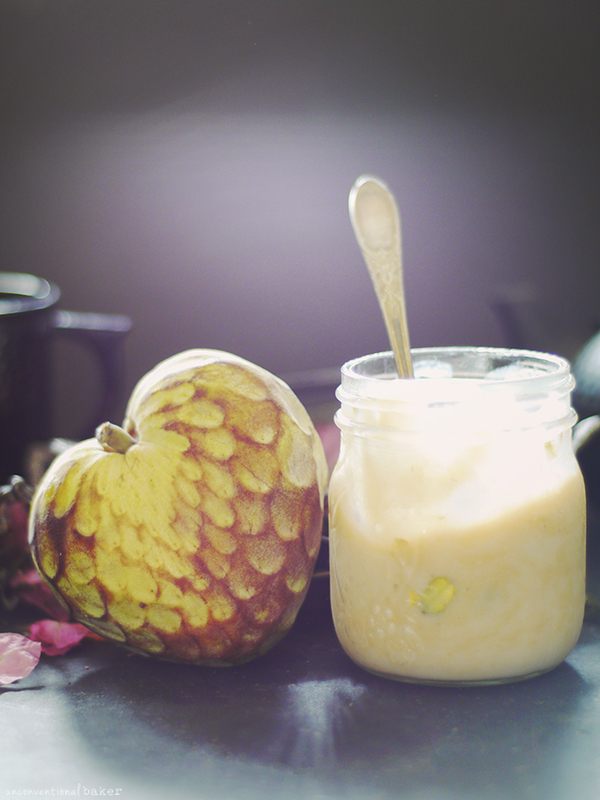 Pain in the behind, which is why you don’t see many recipes using cherimoyas — so much easier to just eat it with a spoon and call it a day, only you have no idea how tasty the custard is… so don’t curse me as you’re doing it… ;) promise, it’s worth the effort. Once you’re done picking out the seeds, it’s a breeze from there. I like to cut mine in half, then scoop out the flesh into a shallow bowl or on a plate, then pick out the seeds with a knife. Then I transfer all the remaining flesh and any juice that escaped in the process into a small blender (I use my magic bullet since it’s a small job). That way you lose the least of the fruit in the process. Note: make sure the almond milk (or cashew milk) you’re using tastes good here. Because it’s such a minimal list of ingredients, if you use a milk you don’t enjoy drinking on its own, you’ll end up tainting the custard too. So everything you put in must be tasty first and foremost. Lastly, a note on texture and freezing times: you’ll need to chill this, but the chilling time can vary. Stick it in the freezer for an hour, and you’ll have a nice custard / soft-serve ice cream. The timing is key to the right texture — if you catch it in the right moment it actually transforms into the best ice cream ever. Freeze it too long and you’ll have a popsicle though — not recommended. Sometimes I make this ahead of time and freeze overnight, which means “too long” for a good texture, which means I thaw it out a little before tucking in. 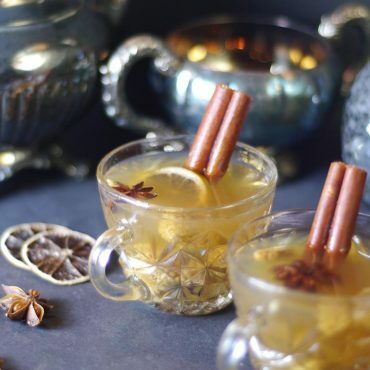 Play around with the chill time until you find the texture you like best. So long as it’s chilled it’ll taste amazing at every stage. 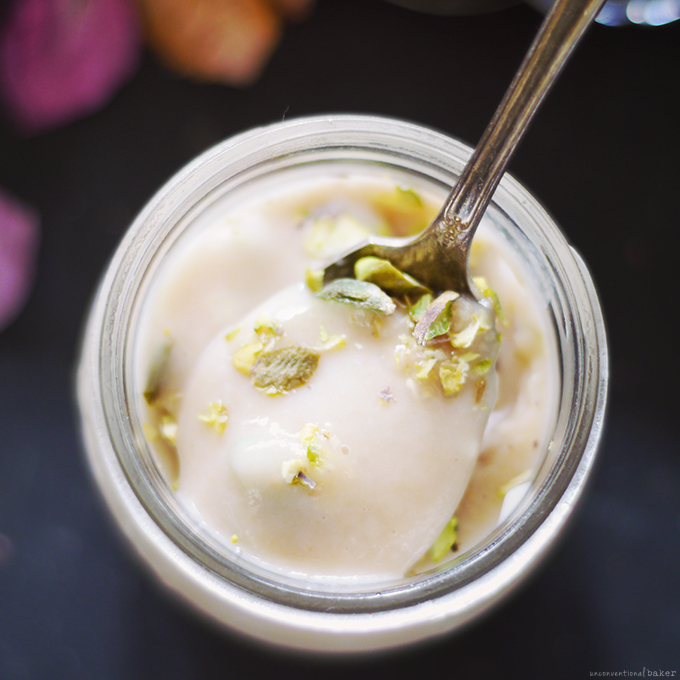 A raw vegan custard recipe featuring the tropical cherimoya accented with hint of pistachio. 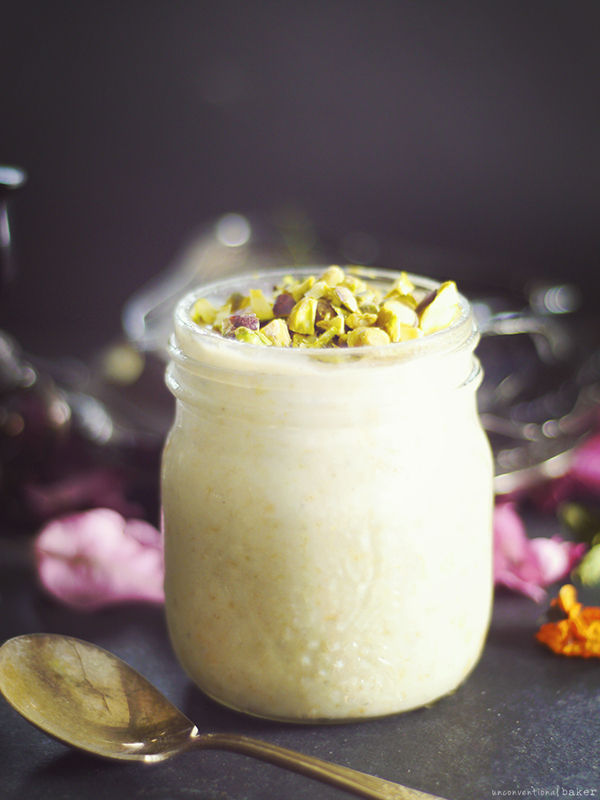 Blend all ingredients, except pistachios, into a smooth texture (only takes a few seconds). Transfer into a glass jar, and cover. Chill in the freezer for about an hour, stir in pistachios, and enjoy! This post contains an affiliate link to the magic bullet blender I used for this recipe. Nice article. Great information and good knowledge. Thank you so much. I’m blessed to live in Australia and I have 5 in the fridge and 3 ripening in the fruit bowl right now – it’s custard apple season here and I’m making the most of it for sure! 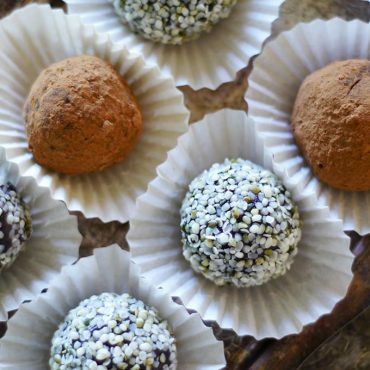 These are Nature’s most perfect desserts – sweet, creamy and perfumed. 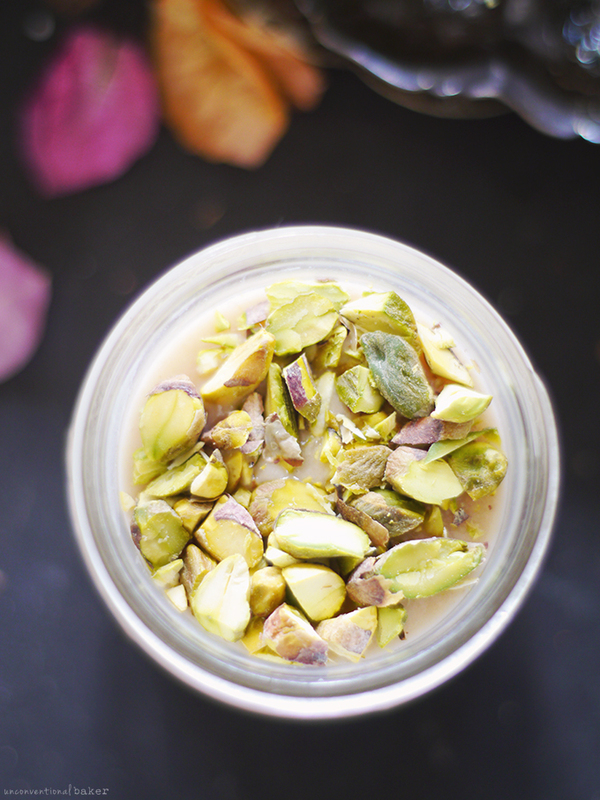 But I have just got to try this recipe – pistachios are another fave and the lemon juice…yum! I know exactly what you mean, Tova. I love the fruit very much as it is. With pistachios it’s lovely too :) Enjoy it! This looks so delicious! When are cherimoya generally in season? Thanks so much, Gina. The season depends on when they are grown (they grow mostly in South America, Asia, Australia, and in the US in California — warm climate). There’s often a surge of them on the market in North America between March and May. The ones imported from California are typically available from the end of the year until the spring. I have just tried my first cherimoya and they are every bit as good as you described! I didn’t get round to making your pudding as I ate my one and only fruit in one go as it was so delicious. Maybe if I every find one again (never seen them before) I will resist and make your pudding recipe as I know it will be devine. I live in the extreme southern desert of California near Mexico and we have an abundance of cherimoya when they’re in season. Everything you said is totally true; they are sublime. I usually just eat them plain and raw when I get them because they’re so awesome they don’t need anything else. At least, I didn’t think they did until I read your post and realized that as a custard they might be even more awesome. I’m totally making this the second I see them in my farmer’s market. How lucky, you are, to have an abundance of them Michelle! :) Enjoy your market haul. I’ve never tried a cherimoya before and I’m so curious to know what they taste like. I’m going to keep my eye open for them! It tastes like you gotta try it, Genevieve :D And you can often find cherimoyas at the Loblaws at Bayview Village. That’s my must stop if I ever visit TO — so many fun things to try in their produce section. They also have them at Pusateri’s for more $$ (same mall). Marula?! ? I never heard of it until now. Just had to go google. Most interesting. Will have to look for it now, and if I ever try some I’ll let you know. Love finding new fruits to try. And interesting about the buttercups! I remember learning in permaculture how animals in general know to avoid the grass that’s bad for them — so chickens, cows, and so on will not eat toxic herbs while grazing… but if you don’t give them enough space and don’t breed them properly then they begin to eat the toxic stuff too due to a lack of selection and end up unhealthy as a result. What is this?!?!?! I’ve never heard of Cherimoyas and definitely can’t say I’ve ever seen one, but I know I would absolutely love them by the way you’re describing them!! Where can I find one?! I need one now!! Ahhhh! I’ve never seen or heard of cherimoyas but now you’ve got me totally intrigued! I’ll keep my eyes open for these ones and the heart-shaped one is the cutest ever!! I hope I can find them soon because this custard looks amazing! Oh I wish I could send you a whole truckload or even two right now, these trees grow effortlessly in my city (bangalore) and every season they produce loads and loads of fruit. This means you should visit India soooon, if the mountain won’t come to Mohammad…. I have never heard of Cherimoyas before and I’m big on fruit! You’ve got me dying to try one and this custard looks divine! I expect the likeliness of finding one over here is Switzerland is next to none, too. :( At least I now to keep my eyes open just in case. I’m huge on fruit too, and this one is definitely a must-try. Happy New Year! I need to find cherimoyas. I want to meet and eat this unicorn food you speak of! How the heck do you have them up there but I’ve never laid eyes on them down here? Unicorns must like Canada better :) I never knew they were the same thing as custard apples though. I am big time drooling over this custard Audrey, I would LOVE to try it! 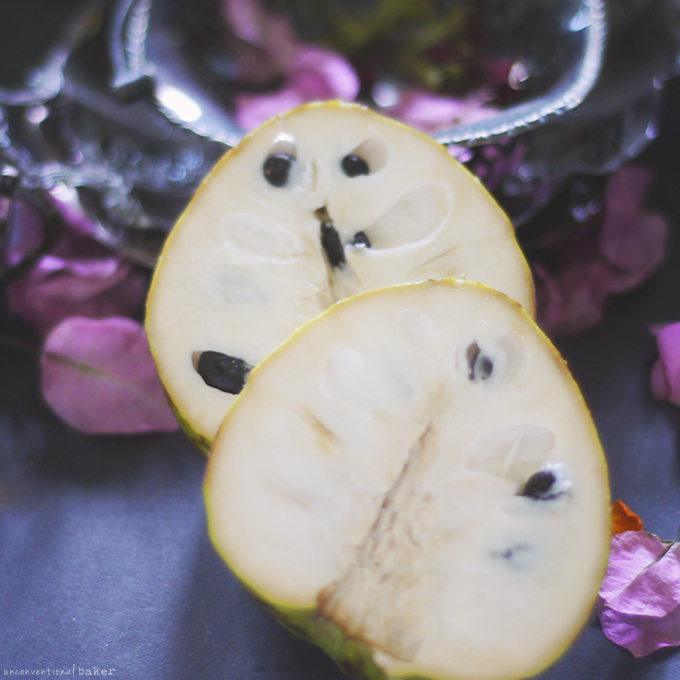 Cherimoyas kinda look like they were made to be custard, just the perfect color and texture. And I love all your descriptions of the taste :D I think I need to find out where they grow and just move there and plant like 100 trees in my backyard. Yeah that’s a good plan. It is strange that we have them here and you don’t down there, since you’re so much closer to where they grow naturally… I find them at either gourmet shops or ethnic grocers. Maybe try a hispanic grocer since it’s commonly grown in some South American countries? I’m proud to say I HAVE had one! (Sent to me by the loving exotic fruit people at Frieda’s). But I wasn’t much of a fan of the soft texture and perfumyness. Regardless though, still a fun exotic fruit!